Halton’s Heritage is a beautifully produced book with an impressive collection of vintage and contemporary photographs chronically the life of William Halton and the county named for him. After years of research author John McDonald has unearthed hundreds of documents that provide an insight into Halton’s prominent family background in England and his career as a civil administrator in Upper Canada. 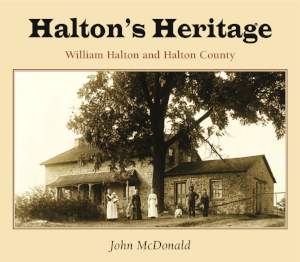 Halton’s Heritage is a thorough history of Halton County and its transition from a small rural municipality to a significant regional municipality within the Great Toronto Area. The book also features a brief history and full page pictorial representation of over 70 settlements in Halton with an emphasis on the origin of each place name. This lovely privately published book will stand for future generations as the reference on William Halton-the man and Halton-the county and region. A busy afternoon outside Clement’s Hardware Store at Main and Martin Street in Milton from Halton’s Heritage.